John Wayne was remarkable for being in good, even great, westerns throughout his career, even the late stages. For example, the best westerns from the late phase of Wayne’s career (after True Grit) are The Cowboys and The Shootist, his last movie, with Big Jake having some attractions of its own. 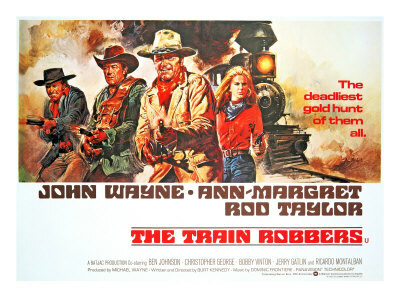 Unfortunately, The Train Robbers, along with Rio Lobo, is one of the two worst from Wayne’s late phase. 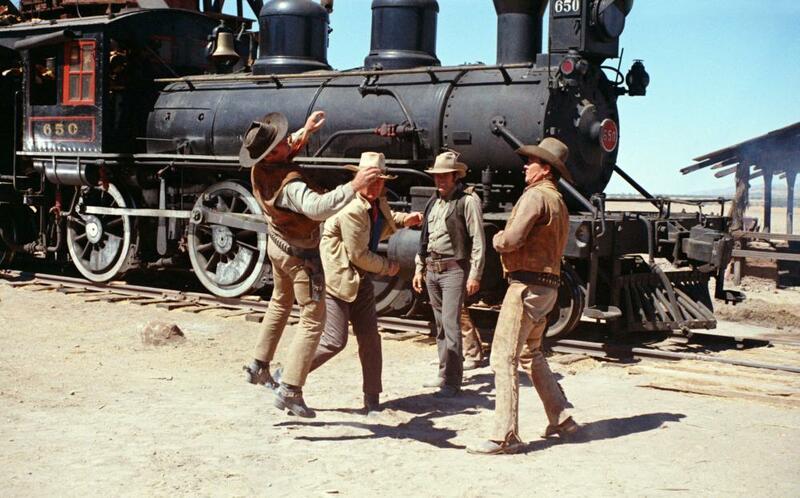 Under the opening credits, a scene unfolds that is reminiscent of the opening of Sergio Leone’s Once Upon a Time in the West, with Jesse (Ben Johnson) and Ben (Bobby Vinton) waiting for Lane (John Wayne, with no first name) to arrive on a train in dusty and apparently abandoned Liberty, Texas. Joining them are Grady (Rod Taylor) with two newly-recruited henchmen. It emerges through their talk that Lane, Jesse and Grady met as survivors of a Union action at Vickburg during the Civil War, which seems now at least twenty years in the past. Lane has called them all together for an expedition into Mexico. As the train arrives, so does Lane, accompanied by a female—Mrs. Lowe (Ann-Margrett, also with no first name). Lane gradually gives them some backstory on the project. Mrs. Lowe is the widow of Matt Lowe, leader of a gang that had stolen a gold shipment worth half a million dollars five years previously. Lowe and two others had taken the gold into Mexico and hidden it there; only Lowe returned. Now Lowe has been killed in a whorehouse, and six of the seven remaining members of his gang served as pallbearers at his funeral. The implication is that they are in pursuit of Mrs. Lowe, as the band heads south of the border, leading an unusually recalcitrant mule packed with dynamite for no obvious reason. It develops that Lowe had hidden the gold in the boiler of the locomotive of a wrecked train four days into Mexico. Lane (John Wayne) renews his acquaintance with Grady (Rod Taylor). Lane’s group sees signs that they are followed by at least twenty men, as well as by a mysterious stranger in a suit, played by Ricardo Montalban. In due course, they find the wrecked train, with the gold stashed in the boiler as described. But the twenty riders find them about the same time. There are attacks back and forth, but, as Lane observes, the twenty apparently can’t shoot worth a damn. There is apparently sexual tension between Lane and Mrs. Lowe, but he reluctantly concludes the age difference is too great. “I’ve got a saddle that’s older than you are, Mrs. Lowe.” As Lane’s group makes a break back for Texas, they keep an eye out for the remains of the twenty, declining to make a stand in the Mexican village because of potential damage to civilians. 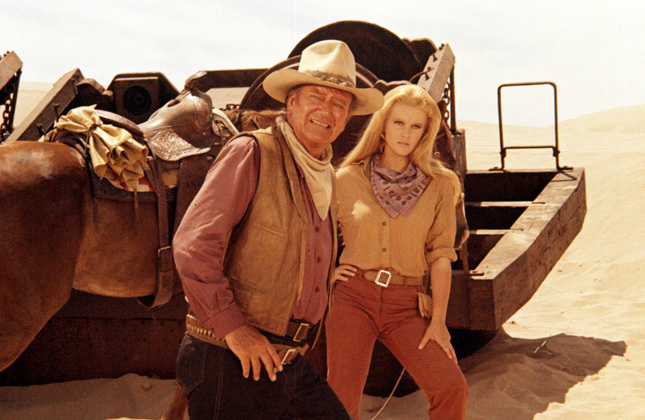 Lane (John Wayne) and Mrs. Lowe (Ann-Margrett) at the site of the gold stash in Mexico. There are a lot of pieces that seem familiar from earlier Wayne movies, but they don’t come together all that well. The names of Lane and Mrs. Lowe seem to come from the principal characters in Hondo. Wayne had met Christopher George on the set of El Dorado, and found parts for him here and in Chisum. This was one of two late Wayne movies (with The Undefeated) in which Ben John plays his aging sidekick and mouthpiece, a device that becomes a bit tedious here. One looks in vain for Bruce Cabot, who usually had a role in Batjac productions with John Wayne. Australian actor Rod Taylor had been a big star in the 1960s (The Time Machine, Hitchcock’s The Birds), but his career was fading now and he has only a small part and third billing here. His only other western was Chuka. Wayne also appears to have been fond of Bobby Vinton (see him also in a small role in Big Jake), who was long past his teen-idol stage by 1973. Ann-Margrett was not a great actress here, although Wayne apparently felt she tended to steal scenes. At a time when revisionist westerns were in fashion, this is not at all revisionist. Writer-director Burt Young was a Wayne favorite dating back to the 1950s; his best writing was for the Budd Boetticher-Randolph Scott westerns of the late 1950s (Seven Men From Now, Ride Lonesome et al.). As a director his high point was the comedy Support Your Local Sheriff. Although he continued to make westerns into the late 1980s (many of them featuring trains), no others are very distinguished. The excellent cinematography is by William Clothier, making his last film. The film is not long, at only 92 minutes, shot in color mostly on location in Mexico (Sonora and Durango). Music is by Dominic Frontiere. This entry was posted in Uncategorized and tagged Adventures in Mexico, Burt Kennedy, John Wayne, Train Robbing on May 31, 2017 by Nicholas Chennault.